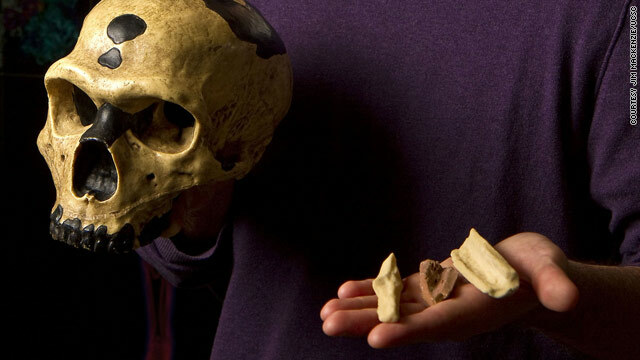 Replicas of the bones from which Neanderthal DNA was extracted are shown with a Neanderthal skull. Researcher: "We can now identify genetic features that set us apart"
(CNN) -- An international team of scientists that spent more than a decade studying remains of Neanderthals has drafted the first genome sequence of humans' closest extinct biological relative. Scientists involved in the project say the findings, to be released Friday in the journal Science, yield important insights into the evolution of modern humans. "Having a first version of the Neanderthal genome fulfills a longstanding dream," said lead researcher Svante Paabo of the Max Planck Institute for Evolutionary Anthropology in Leipzig, Germany. "For the first time we can now identify genetic features that set us apart from all other organisms, including our closest evolutionary relative," Paabo said. The findings are based on bone samples of three female Neanderthals excavated from Croatia's Vindija Cave. Scientists have estimated the specimens to be 38,000 years old. Scientists say they have mapped 60 percent of the genome. They will continue working toward a complete sequence, a project expected to take years. Scientists compared the Neanderthal genome with the genomes of five present-day humans from different parts of the world: France, China, Papua New Guinea and southern and western Africa. The findings suggest that modern humans, after migrating from Africa 45,000 to 80,000 years ago, bred with Neanderthals then in the Middle East before spreading into Eurasia. The authors estimated that 1 to 4 percent of the modern human genome of non-Africans can be traced back to the Neanderthal. "The main finding is that there was gene flow from Neanderthals into the ancestors of modern non-Africans," David Reich, a geneticist and associate professor at the Harvard Medical School Department of Genetics, said Wednesday. Neanderthals first appear in the European fossil record about 400,000 years ago. Roughly 30,000 years ago, the cave-dwelling hominids in Europe and Asia went extinct. Extracting DNA from the ancient bone samples was a daunting feat. "Six or seven years ago, I thought it would be impossible, at least my lifetime, to sequence the entire nuclear genome of Neanderthals," Paabo said on the call. Using a delicate dental drill, researchers collected 500 milligrams of bone powder, roughly the size of a pill, from which to analyze and isolate DNA samples. The bone samples contained very little preserved Neanderthal DNA. According to researchers, 95 to 97 percent of the DNA extracted was bacterial or from other organisms that had colonized the bone. The DNA fragments that were recovered were extremely small and contained chemical modifications that could have yielded false data. Researchers also had to take special measures to extract the Neanderthal DNA without contaminating it with human DNA. They employed new computer technologies to map the 4 billion-nucleotide Neanderthal genome. "With this paper, we are just scratching the surface," said Richard Green, assistant professor of biomolecular engineering in the Baskin School of Engineering at the University of California, Santa Cruz, and the lead author of the paper describing the new research. "The Neanderthal genome is a gold mine of information about recent human evolution, and it will be put to use for years to come," he said.